Below are the Spring Summer 2019 key looks from Interiors company Graham and Green . Many of the key trends seem to be carrying on from recent seasons these include Berber Rugs. Metallics are still around : rose gold and copper being the most popular. Neons and succulents are still with us, as are fifties and sixties inspired cane chairs on spindly legs. Talking of legs, G&G are selling a fine line in patterned and embossed ceramic pots that stand on tiny feet so they are slightly elevated from the surface on which they stand. Velvet in strong acid yellows and rich royal blues are still being used to cover sofas and chairs. There are some metallic mouse lamps – sure they are cute if thats your thing but personally I can’t stand rodents and prefer the birds shown in the image below. To sum up, it is a strong cohesive collection all fabulously styled. You regularly buy things to replace items you already own because you can’t lay your hands on them right now. You regularly lose your glasses, keys, phone and tv remote. Or if like me recently, when the night before I was to fly to Armenia I couldn’t locate my passport. It was 2 hours of anxiety and turning everything in the house upside down before I found it. Unlike other books on this subject, Debora does not expect you to totally readjust your world to minimalist living. She offers practical advise including allowing a certain amount of time to clear up. She suggests buying a kitchen timer and using it. Decide how much time you can spend on a task on any given day and just spend that amount of time and no more. She suggests keeping a diary of what you wish to achieve and offers tips on what you need to do daily, weekly and monthly and even how to clear up if you only have a spare ten minutes. She gives information on how and where to get rid of useful unwanted items. I have made so many visits to charity shops during the last month! I am a craft author and run workshops so I am a great one for collecting all kinds of tools, materials and ephemera. ‘Oh that will come in handy sometime”. Reading that Debra writes on cookery and gardening I realized that her pile of stuff probably bears a resemblance to my own. So I am even more impressed. What this book does, is encourage you to create new habits that will enhance your life. I knew this book was good because as I was reading it, my friends kept asking if they could borrow it after me. Well it is a great book based in reality and full of practical advise and No you can’t borrow it. I’m keeping my copy and authors like Debora deserve people to buy their words of wisdom. So go out and buy your own copy, you won’t regret it. Creativecolour.org’s Juliet Bawden has been to the design shows in London and Paris and has come back with what’s hot to trot for the coming months in interior design. Want to be the first to know next year’s trends? Well you have come to the right place. I bring you news of all that is new and desirable from Paris Design week and the enormous trade fair known as Maison et Object and London Design week including Decorex, Design Junction and 100% Design. When 100% design started in 1995 it was the first organisation to promote design throughout London. It lost its way for a while and became too big and unwieldy, there was a changeof venue and ownership and now it is back on course and this year has exceeded expectations with the promotion of new young talent and innovative design. For the first time the design team have the input of Barbara Chandler the Design Editor of Homes and Property in London’s Evening Standard. She has always championed new designers as well as being a great photographer in her own right. She has curated 100% Forward. This section of the show that spotlights seven emerging design talents each of whom has been chosen by an established designer who launched their own career during the first decade of 100% Design. The designers are Simon Pengelly a furniture designer who has nominated Daniel Schofield, industrial and product designer. Michael Marriot furniture and product designer has nominated a furniture designing team Dominic Postlethwaite and Will Dyer. Chris Eckersley a furniture designer has nominated weaver Majeda Clarke and they have collaborated on some projects together. Philip Watts interior designer and designer maker has nominated Light Up North, makers of creative neon. Ella Doran surface print designer has nominated Kyla McCallum whose work Foldability + Northern is beautiful and intricate. Jocelyn Warner who launched her own wallpapers at 100% design haschampioned Stoff Studios who design furniture and textiles .Samuel Chan furniture designer has nominated Moe Redish a multidisciplinary designer currently creating glass ware made by blowing into a wooden mould. Here are the key trends for 2019. Dulux colour of the year for 2019 is Spiced Honey and it is a warm comforting tone that will go with most of the key looks for next year, but it is the colour green that is very much in evidence everywhere. As a colour and as a life style concept of bringing the outside in itis a very strong trend. Sometimes it is shown as a flat colour at other times it is mixed with foliage and flowers. Lighting has been influenced by the popularity of steam bent wood and laser cutting. There are many lightshade made using both these techniques and the result is fabulous patterns on the walls when the lights are on. Laser cut screens and wall treatments are being used on exteriors of buildings on balconies and fences. They are used as indoors as room dividers and screens. Awareness of the environment, means that designers are finding new ways of using up waste, and recycling materials such as coffee grounds, paper and cardboard. IKEA have made some elegant dining chairs from that come in both black and white and are made from recycled plastic. As we are using less and less plastic bags we need replacements. Baskets are still popular either in natural straw and hemp weaves or in bright woven plastics. Stretchy string bags in a variety of colours are popular too. Bamboo, a fast growing sustainable wood is very much in evidence used in a variety of ways from flooring to fabrics and bowls. The craze for wall papers that look as though they are made from something else be it aged wood or three dimensional ceramic tiles doesn’t look as if it’s going away any time soon. Florals and bright colours including fluorescents are still popular. Using a multi mix of patterns with one another is a trend in soft furnishings that echoes that of the fashion industry. Rough textures on surfaces such as walls, interesting finishes and weaves on fabrics and anything ‘natural’ or ‘eco’ friendly is going to be everywhere over the coming year. Felt is a very strong look in interiors. Concrete is being used more and more unusual and innovative ways. Nineteen fifties or Mid Century Modern furniture and accessories are hugely popular, as in the original or as inspired by. The Vintage furniture pop store took place in Galerie Joseph. Paris had a pop up selling original furnishings and accessories from the nineteen fifties and early 1960’s. Baskets are very popular still and stretchy string bags. If you are considering building a house or replacing your front door you could do no better than looking at the work of Urban Front who design and make the most desirable enormous steel reinforced hardwood doors. As a keen follower of Kate Watson-Smyth ‘s blog Mad About The House, I have been looking forward to her book with eager anticipation. The book is written in much the same way as her blog: clear informative and witty, honest with a small amount of self-deprecation. As she freely admits she is not an interior designer and has never hired one. However she is a journalist who has been writing about interiors for the last twenty years, and who in that time has interviewed some of the best brains in the business. If you are expecting a big colourful coffee table book, then you will be disappointed. There are a few lovely sketches and a few photographs including one of Kate’s own home taken by Paul Craig. What you do get is really good advice and help. Since starting her blog in 2012 she has become the number one interiors blog and has won many awards for it. Kate enjoys finding her own style, and in this book she gives you ways in which to find your style. “Every room should have something that draws you in. An amazing piece of furniture, a funky light, a family heirloom.” As she says all homes have common elements whether it be a one bed flat or a ten bedroomed villa. In this book she guides on how to make your home tell your story. Much needed advice is given on how to use Pintrest, so that it is an effective tool when planning an interior space. The chapter on the various colours, their meanings and how to use them in interiors, and what goes with what is extremely useful. For those struggling with colour her idea of looking in your wardrobe to see the colour palette you love, is inspired. In the same way that outfits are put together with a main colour and then accessories in different colours, so a room is put together. Whatever your style, this book will guide you through everything you need to know to decorate your home with confidence and individuality. Kate reveals the rules of rug layout, explains how to buy a sofa, and shows how to get the lighting right in every room. A must-have book for anyone who wants make their house a home. Create your own Decal Plates! 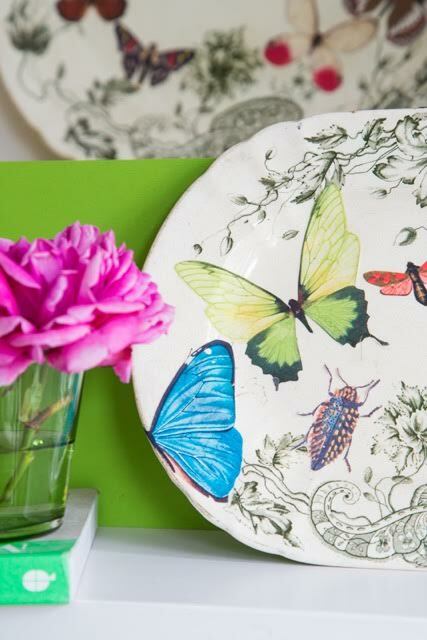 If you’ve got stacks of old crockery that’s starting to look a little dated, tart it up in a flash with easy-to-use DIY transfers. First, choose your favourite images, and print them onto waterslide decal paper. Use a scalpel or a small pair of scissors to cut out the images, then use Blu-Tack to temporarily attach them to the china in a composition you’re most happy with. One image at a time, peel backing away to reveal the tacky side, stick in place and leave to dry completely. Update a tired lampshade to create your own quirky masterpiece with this easy DIY, and choose from 31 beautiful shades in the Rust-Oeum’s Chalky Finish Furniture Paint range to decorate. It’s perfect for upcycling and can be applied directly onto most surfaces, including wood, without any preparation! Step 1 – Remove all material from the lampshade to reveal the wire frame. Step 2 – Saw the wooden batons into pieces the same height as the shade, plus some slightly longer and sand the ends to remove any jagged edges. Step 3 – Paint the batons with your chosen Rust-Oleum Chalky Finish Furniture Paint colours (we used Pumpkin, Ink Blue, Hessian, Chalk White and Clotted Cream) and leave this to dry before applying a second coat. Step 4 – Using a glue gun, apply hot glue to the underside of a baton and stick this to the wire shade. Repeat with different coloured batons until the entire shade is covered.